This is the second year that organisations employing 250 staff or more have been required to report on their Gender Pay Gaps. 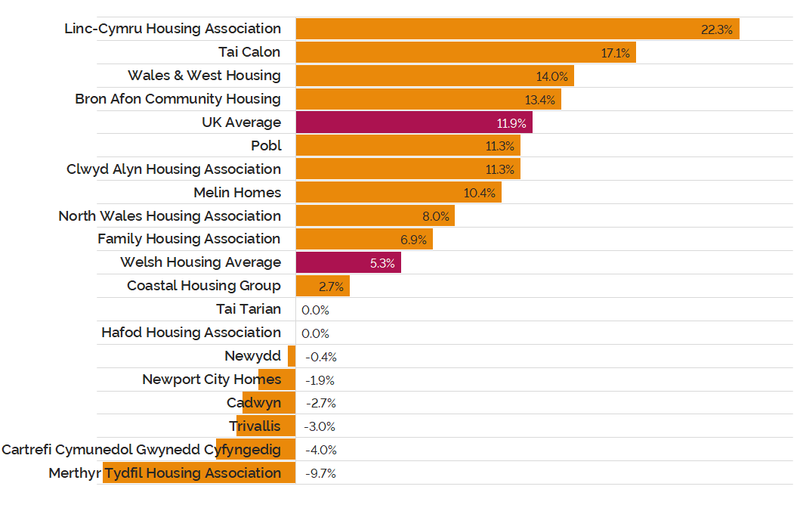 Tai Pawb have analysed figures from 18 housing associations in Wales to compare the gap with the rest of the UK. This is a combination of mandatory reporting and voluntary reports from associations with fewer than 250 employees. Figures for 2018-2019 show a reduced median gap of 5.3%, compared to last year’s figure of 6.5%. This compares with an average of 11.9% from all UK companies to submit data, and 8.1% from an analysis carried out by Inside Housing of a sample of 43 of the largest UK housing associations. The median gap means that if all hourly pay rates for men and women were each listed from smallest to largest, the man in the middle would earn 5.3% more than the woman in the middle. The mean gap, i.e. the total hourly pay divided by number of staff, stands at 5.9% (7.4% in 2017-2018). However, the median gap is mostly commonly used as a comparison as a few high hourly rates can distort the mean figure. 2018-2019 figures are based on a snapshot of staff pay on April 5th 2018. The percentage is the difference between men and women’s hourly rate, a positive figure shows that men are paid more, and a negative figure shows women earn more. Though there may have been an expectation of the gap uniformly swinging towards 0%, in practice this is a complicated task that requires time and resources. Despite a range of results, the gap for Welsh housing associations still paints a positive picture as it is significantly less than the average median gap from all UK companies that submitted data which stands at 11.9%. We’ve seen the median gap narrow by nearly 20% in the Welsh housing sector from a figure that was already well below the national average. This also bucks the trend from the UK’s largest housing associations where more than half saw their gender pay gap grow (Inside Housing). Interestingly, 9 of the 13 associations that we can compare mean data for saw a fall in their pay gap, and 3 others saw their negative gap (i.e. women were being paid more) increase slightly to be closer to 0%. There are more women than men in the lowest pay quartile, and this is often credited to more women working in care roles which are generally lower paid. There are more women in this quartile in 8 of the 16 associations that provided figures, but where this is the case, women tend to outnumber men by more than 2:1. 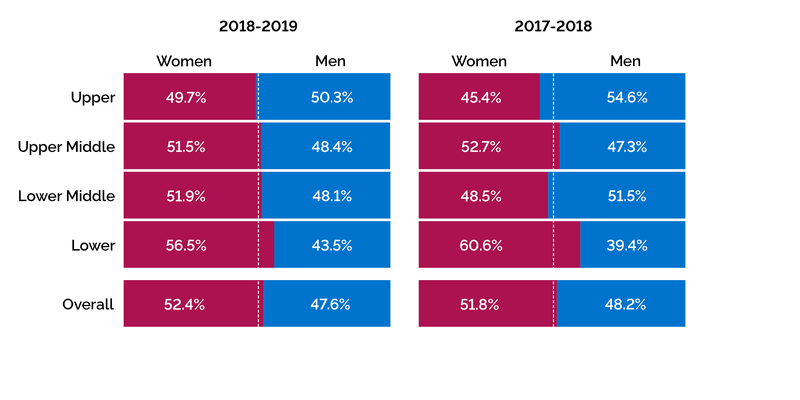 The middle quartiles are slightly in favour of women with just under 52% in the upper and lower sections, and the top quartile is almost exactly even. Whilst Wales has a higher number of female CEOs than male, this suggests there is a very slight imbalance toward men in other senior level roles. The proportion of women in housing has grown against men to 52.4% with increases in the lower middle and upper quartiles. Whilst more women work overall in housing, the balance throughout the pay quartiles is extremely encouraging, with the middle 50% being very closely proportional to the overall picture. Only 4 associations pay bonuses and these have huge variations so we have recorded the data but not made any attempt to analyse it. The UK Government’s Gender Pay Gap reporting does not require anything written to accompany the figures, but it is recommended that some analysis take place to better understand the data. Many of our reporting members stated that they had implemented schemes and begun processes that should yield long term results, such as pay restructuring, new corporate objectives and a leadership programme. Common themes in these reports included reviewing job roles and adverts across the organisation for gendered language, as well as introducing and promoting flexible working. As mentioned previously, the amount of women in lower paid care roles is higher, and is unlikely to change greatly without a large cultural shift. However, work is being done to encourage more men into the caring professions as well as women into manual trade roles. “It’s encouraging to see the progress being made by Welsh housing associations on the Gender Pay Gap. It is a positive story, especially compared to the rest of the UK. Tai Pawb commissioned a Gender Pay Gap report in 2018 and the key principles and challenges outlined in that document can be still be used as a guide for how to improve in the future. If you would like support in analysing and reducing your gender pay gap, or have a positive story to share please get in touch with us.